Patrick Charbonneau has been a program coordinator at Sojourn for over 6 years. With two small children at home, he comes around less often, so we were happy to see and learn from him during Friday’s recital! 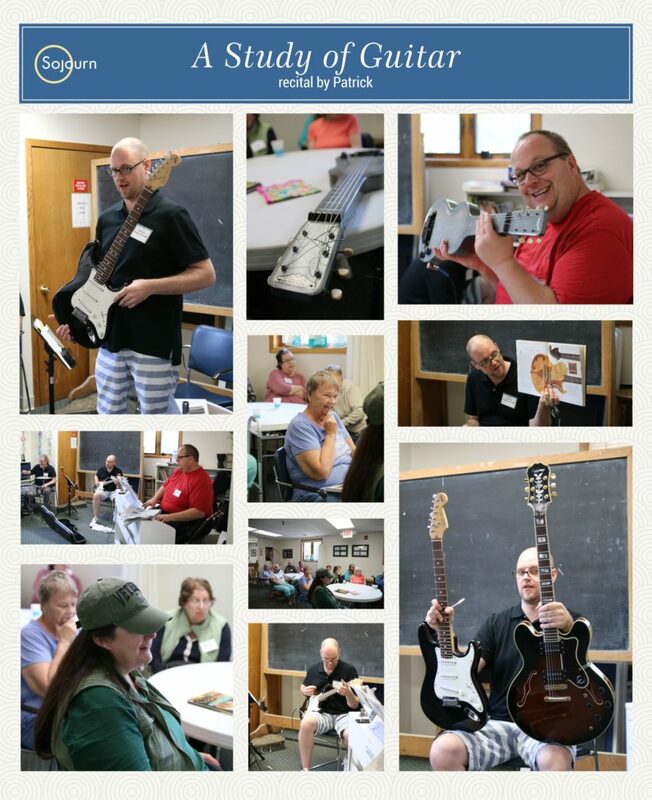 While Patrick has a degree in Music Composition, he focused the recital on the history of guitar. The steel-string and electric guitars we know today are American inventions. Instead of just playing songs, he took time to teach Sojourners about the different kinds of guitars and where they came from. With books full of pictures and several guitars, he was well equipped to answer Sojourners’ many questions. First, Patrick pulled out an antique Hawaiian electric guitar, a style born of the 1930s. Known as a “lap steel guitar,” guitarists would lay this guitar flat on their knees to play it! Patrick played some chords to demonstrate, and the classic, Hawaiian sound filled the room. The leaning style guitar we know was called a Spanish guitar at the time. Patrick continued to work his way through history to the electric guitar as we know it today. He had two beautiful models for us to admire—a Fender and a Gibson! Each brand brought new innovations to the guitar, and they continue to make bestselling instruments. The Fender and Gibson fully explained, Patrick settled in with friends to play some country and rock classics. Between drums, guitar, piano, and vocals, it was the perfect way to end the week at Sojourn. Patrick doesn’t play with bands often due to time constraints, so he enjoys coming to play at Sojourn. “I get to use my skill here,” he said. He can connect to Sojourners through music, and he likes hearing which songs speak to them the most. Thank you for sharing your knowledge and music with us, Patrick! We look forward to the second part of your recital next week.